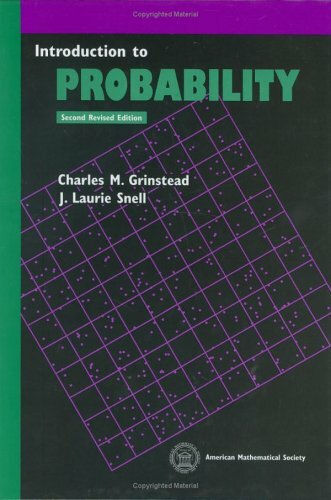 [PDF] Introduction to Probability by Charles M. Grinstead | Free eBooks Download - EBOOKEE! Description: The text is designed for an introductory probability course at the university level for sophomores, juniors, and seniors in mathematics, physical and social sciences, engineering, and computer science. It presents a thorough treatment of ideas and techniques necessary for a firm understanding of the subject. The text is also recommended for use in discrete probability courses. The material is organized so that the discrete and continuous probability discussions are presented in a separate, but parallel, manner. This organization does not emphasize an overly rigorous or formal view of probabililty and therefore offers some strong pedagogical value. Hence, the discrete discussions can sometimes serve to motivate the more abstract continuous probability discussions. Features: Key ideas are developed in a somewhat leisurely style, providing a variety of interesting applications to probability and showing some nonintuitive ideas. Over 600 exercises provide the opportunity for practicing skills and developing a sound understanding of ideas. Numerous historical comments deal with the development of discrete probability. The text includes many computer programs that illustrate the algorithms or the methods of computation for important problems. No comments for "[PDF] Introduction to Probability by Charles M. Grinstead".